The shop is full to the brim of fall garlands and florals...orange leaf garlands with pinecones, orange bittersweet garland, gourds & pumpkins. 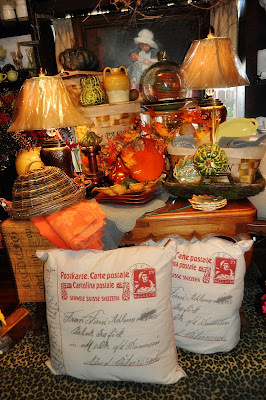 Loving these extra large script stamped linen pillows, wicker cloche, and copper glass chargers. Spode Woodland and Spode Blue & White is also starting to arrive for Fall!